The new tower of the Phänomenta Science Centre in Germany is an LED-lit membrane structure that demonstrates the dynamics of the Earth's rotation to museum visitors. 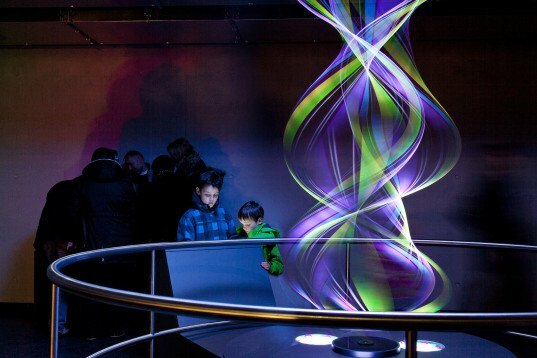 It shelters a 30-meter-long suspended Foucault pendulum that provides an experiential explanation of our planet's revolution and includes a stunning panorama projection of the city of Lüdenscheid. Several teams worked on different aspects of the project, including designers from Beier+Wellach Projekte, who were in charge of the interior, whileKKW Architekten worked with Winkels Behrens Pospich Ingenieure für Haustechnik GmbH to develop the lighting system, and WERNER Bauingenieure and formTLIngenieure created the impressive two-part structure made of a steelwork frame and a membrane. The 76.1-meter tall structure was built as part of a two-story extension of the museum’s science center, providing an additional 1,400 square meters of exhibition space. Basing the design on a feasibility study by Frankfurt-based architecture firm Schneider+Schumacher, the designers decided to use the concrete building bellow as the foundation for the steelwork and create an elegant light-weight structure that supports a helix-shaped membrane stretched over it. Thanks to the fact that the pendulum is suspended independently from the primary structure, vibrations produced by wind are unnoticeable in the interior. The structure itself consists of circular hollow tube sections welded together and were calculated through comprehensive 3D CAD analyses. The membrane has an appearance of lightness and is illuminated by different-colored LEDs. Its helix form consists of three structural components: membrane, three structural cables and anchoring rods with clamps. Inside, the 30-meter long pendulum creates an immersive experience that resembles an oversized kaleidoscope. Thanks to the fact that the pendulum is suspended independently from the primary structure, vibrations produced by wind are unnoticeable in the interior. The 76.1-meter tall structure was built as part of a two-story extension of the science center which provided additional 1,400 square meters of exhibition space. Using the concrete building as the foundation for the steelwork, the designers created an elegant light-weight structure that encompasses a helix-shaped membrane stretched over the interior. The structure itself consists of circular hollow tube sections welded together and were calculated through comprehensive 3D CAD analyses. The membrane has an appearance of lightness and is illuminated by different-colored LEDs. Its helix form consists of three structural components-membrane, three structural cables and nice anchoring rods with clamps. Inside, the 30-meter long pendulum creates an immersive experience that resembles an oversized kaleidoscope.